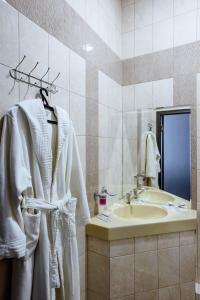 A-HOTEL.com - Luxury and cheap accommodation in Tinaki, Russia. Prices and hotel, apartment booking in Tinaki and surrounding. Guest House Svetlana is set in Astrakhan and features barbecue facilities and a garden. Boasting a 24-hour front desk, this property also provides guests with a restaurant. Only a 5-minute walk from the historic centre of Astrakhan, Private Hotel offers rooms with a minibar and satellite TV. Facilities include an indoor pool. Situated on the banks of the Volga River, Azimut Hotel Astrakhan offers comfortable rooms with satellite TV and free WiFi. The historic centre of Astrakhan is only a 5-minute walk away. Kvartira Klass Apartments at Chekhova 103 is located in Astrakhan. Guests staying at this apartment have access to free WiFi, a fully equipped kitchen, and a balcony. The Grand Hotel Astrakhan offers 5-star luxury on the banks of the Volga, in Astrakhan. It offers rooms with free Wi-Fi and satellite TV. Set in Astrakhan, Апартаменты Московская 106 features air-conditioned accommodation with a balcony and free WiFi. The apartment is equipped with a satellite flat-screen TV. Surprise Gorkogo features free WiFi and rooms with air conditioning in Astrakhan. All rooms feature a flat-screen TV with satellite channels and a private bathroom.